Planning a road trip around Andalusia? You just cannot skip Granada! This city known for its most generous Tapas between Andalusian people is located just a few kilometers from the Sierra Nevada mountains group has to offer a lot of beautiful, historical places to see together with stunning mountain views and its activities. Granada like all historical cities has to offer a lot of touristic attractions based in the old town. The most important one without any doubt is the Cathedral of Granada. Granada Cathedral or the Cathedral of the Incarnation officially called La Santa Iglesia Catedral Metropolitana de la Encarnación de Granada origins dates back to XVI century and is considered to be one of the oldest to be found in the peninsular territory in the Cristian West. The cathedral consists of two towers where the left one is called the tower of San Miguel, main chapel, as well as 14 other chapels together with Sacristy and Royal Chapel (Capilla Real). Apart from the Cathedral, it is definitively worth visiting two other religious monuments Basilica St. John de Dios and The 16th-Century Monasterio de la Cartuja. The Monasterio located around 25 minutes walking to the north from the city center will leave you without words after you enter. Its decorations make this church one of the most extravagant religious buildings in Spain. On the other hand, the Basilica is considered to be one of the most valuable Baroque temples of Spain. You cannot miss the area of Albaicín and Mirador of San Nicolas while in Granada. Here not only you can listen to the street performances, eat some delicious local foods especially Tapas but also, view Alhambra from another perspective. It is highly recommended to get to Mirador of San Nicolas in the evening and see the magic of Alhambra in the dark. Granada is probably known the most for the Alhambra – the city, fortress, and palace erected by the monarchs of the Nasrid dynasty of the Kingdom of Granada, located on the hill just 1 kilometer away from the city center. The Alcazaba, Generalife, Palace of Charles V (Palacio de Carlos V), Nasrid Palaces (Los Palacios nazaríes), various courtyards and towers forms part of the Alhambra. The first information about the existence of Alhambra dates back to IX century however, it is believed that the construction of the complex stared even earlier. Historically it is known that Alhambra was a palatial city, the Christian Royal House, the General Captaincy of the Kingdom of Granada and a military fortress. In 1870 it was declared as a Monument and since then it is considered to be the most visited monument in Spain and the masterpiece of Muslim art in Europe. Nowadays Alhambra is visited by more than 2 million people every year coming from all the corners of the world. It is clear that you just cannot miss the opportunity to visit the Alhambra and we will provide you with some tips to make it happen. First and the most important tip is: do not forget to buy tickets in advance! The most comfortable way to do so is to buy them online. The tickets during the most touristic period of time can be available at least 2 months in advance especially during the weekends, thus make sure to buy them on time! 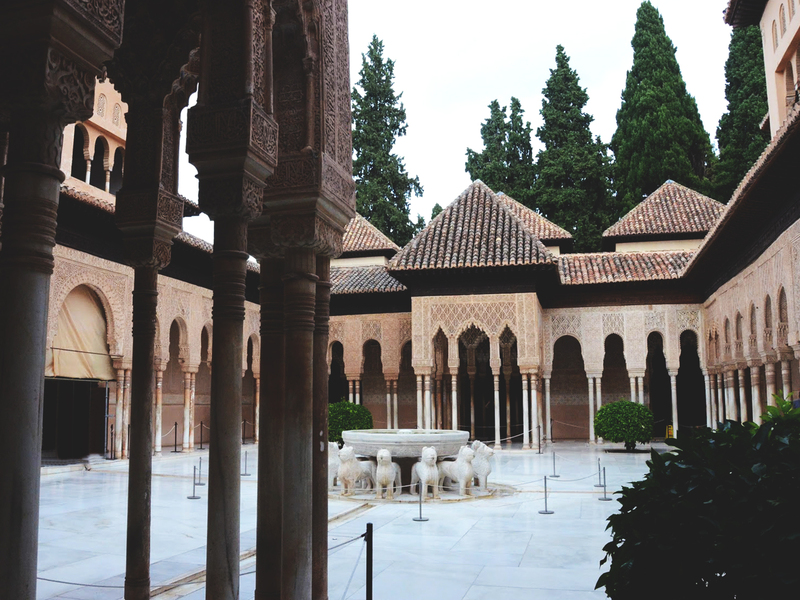 Tip number two: the Alhambra is open all year round except the period between 25 of December and 1st of January. However, working hours of the monument changes depending on the time of the year and the type of tickets you want to get. Thus we would highly recommend checking the official website of Alhambra prior. Tip number three: have at least half of the day for the Alhambra. The complex is relatively big and requires time to explore it completely. Hence, if you want to really enjoy your time, don’t stress and see each part of the monument, you must dedicate at least 5 hours in ideal case 1 full day for it. Tip number four: have a guide or at least get the ticket option which includes entrance in Nasrid Palaces as well as the Gardens. And last but not least tip number five: if it is possible don’t go to Alhambra during the peak months of May, June, July, August. Firstly, it is super busy and you will spend double of time waiting in the lines. Secondly, during the summer weather temperature in Granada can reach a peak of 42 °C making your visit hard and super miserable. Thirdly, Gardens of Granada are in the full bloom during the Spring making a month of April to be especially suitable for the visit. Nature beauty cannot be excluded from Granada’s visit. The Sierra Nevada is a mountain range located in the province of Granada containing the highest point of continental Spain the third highest in Europe. Thus, those skiing, snowboarding or other snow sports enthusiast for sure will have a possibility to check Sierras Nevada’s resort during the season period. Check out our article, Sierra Nevada- Skiing Resort of Spain, for more information. However, if you are coming during the summer when the skiing resort is closed or you are just not a fan of snow, you can still have an amazing sightseeing of Sierra Nevada. We would highly recommend trying to hike one of the peaks of Sierra Nevada, Puntal de Loma Púa. It is relatively easy, you can drive by car until the parking called la Hoya de la Mora, then take a small minibus (prior reservation might be needed) until Valeta and from there hike 40 min up to the top. If you are not fancy hiking you can just drive until the previously mentioned parking lot and if you are lucky enough you will be able to see the majority of the peaks of Sierra Nevada just from there. Moreover, not many tourists know about this place called Canales Reservoir which is another beautiful attraction close by the Sierra Nevada offering stunning views and the impressive road alongside. We promise tons of selfies and amazing nature photos for the Instagram you will have for sure! Prepare yourself for the full of activities, unforgettable views, and positive emotions days in Granada. No matter what you choose to see and experience, we are sure you will fall in love with this Andalusian city.